A top PSNI officer has said he understands the ‘anger and frustration’ of the community after a young man, who was struck by a police baton, remains seriously injured in hospital. Distric Commander Superintendent Davy Moore was speaking after a 28-year-old man suffered a severe head injury during a disturbance in Lurgan in the early hours of Monday morning. Police had gone to a disturbance outside a bar in William St and during the incident the man was hit on the head by a police baton. 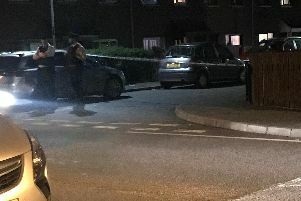 Claims have been made that the man had been attempting to help break up a fight however he ended up seriously injured and remains in Intensive Care at Craigavon Area Hospital with a serious brain injury. Spt Moore said “I understand the anger and frustration felt by many people following the events in Lurgan early on Monday morning. “I am limited around what I can say given that we informed PONI (Police Ombudsman of NI) of the circumstances at the first opportunity and they are now carrying out an independent and impartial investigation. “What is paramount is the wellbeing of this young man who remains in hospital with injuries sustained in the incident. I sincerely hope he makes a full and speedy recovery. The statement follows a meeting with local SDLP and Sinn Fein politicians who were concerned about the incident. Yesterday Sinn Féin MLA John O’ Dowd called for the police officer allegedly responsible for striking the young man to be suspended from duty, while an investigation is conducted. Mr O’ Dowd was speaking after he and Councillor Keith Haughian met Spt Moore in Lurgan. He said: “I told the District Commander that this was the most serious and shocking incident involving police I have dealt with in this last 15 years. “If it hadn’t been for the swift actions of the victim’s friends, in bringing him to hospital, we might have been dealing with a death. “Eyewitness have claimed that, the young man struck by the police officer, was posing no threat to police or anyone else and that he was struck from behind on the head and then struck again while on the ground. “It’s my view that the police have misled the public by stating in a public statement that they were dealing with a ‘large aggressive crowd’ when the young man was struck. “They were not dealing with an aggressive crowd at the time the young man was struck. “The crowd became agitated after the young man was assaulted. “There are also serious questions to be answered by the police as to how they allowed a seriously injured man, who was at one stage unconscious, to leave the scene without receiving first aid and being placed in an ambulance. “The question remains - why was it left to friends to bring him to hospital where he required an emergency intervention to save his life. “The Police and the Police Ombudsman must act quickly and suspend the officer responsible for the terrible injuries inflicted on this young man.